This book could scarcely be more timely. 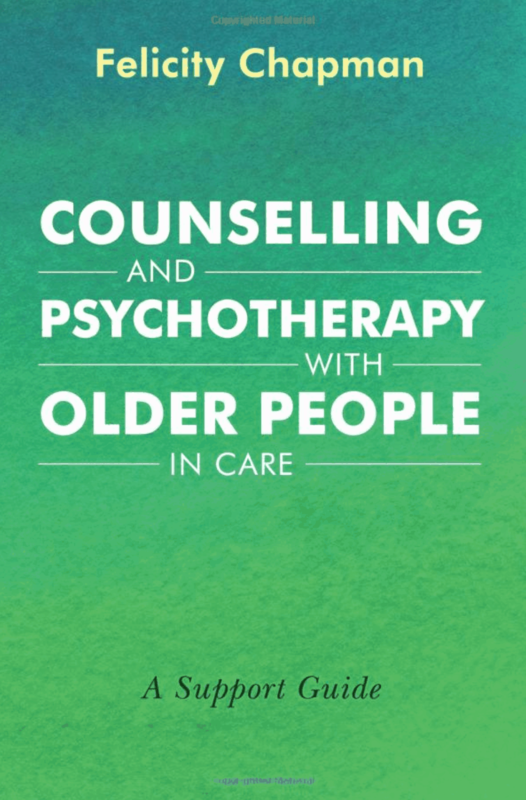 As the proportion of aged persons continues to increase across most populations (United Nations 2002, p15), guidance as to how psychotherapists can contribute to supporting our clients who comprise this sector – not to mention other clients of ours, and even we ourselves, who are endeavouring to support elderly relatives – is both welcome and needed. Although much of the material derives from Australia, and notwithstanding the fact that it was primarily gathered from residents living in care facilities, the issues raised and the challenges presented are applicable to anyone contending with the wide variety of changes associated with the ageing process, irrespective of the circumstances in which they live. As a therapist with some experience of working with the elderly – or “seniors”, the author’s arguably more respectful term – I was heartened by her aim ‘to be clinically relevant while still offering an alternative approach’ (p19). What is meant by ‘alternative’ here includes skills and orientations that extend beyond the disciplines of clinical psychology and mental health social work, and what kept me reading on was their foundation in “practice-based evidence” as opposed to the “evidence-based practice” to which we are all too often exhorted to adhere. Unlike childhood, for which there now exist recognised, fairly standard incremental stages of development, ‘when it comes to defining “old age” beyond the amount of years one has lived, there are many variables to consider’ (p20). Thus, it was helpful to bear in mind the four categories of ageing identified by gerontologists – chronological, biological, psychological and social – all of which have their own distinct features, although there is often considerable interaction or overlap between them. The book is divided into three parts that deal successively with “Context”, “Intervention” and “The Bigger Picture”, in each of which there were, for me, certain issues that resonated. Take for example “The referral context” (Chapter 2). I know from my own experience that the older people we are currently likely to encounter very seldom self-refer for therapy; our first contact is often with a concerned family member, a medical practitioner seeking psychological support for a patient suffering from one or more physical complaints, or a care-worker desperate to secure the person’s compliance. This raises the question “Who is my client?”, the answer to which at any one time can be any or all of these, to differing degrees. Added to this, many of today’s older people consider themselves to be “The Lucky Generation” who have survived two world wars and the hardships that followed; to them seeking help – let alone a kind of help that in their era was usually associated with “madness” – can not only be perceived as a sign of weakness, but it can also intensify existing levels of distress. This underlines the need for us as therapists, while being mindful of boundaries and appropriate levels of confidentiality, to build trustworthy relationships with those involved with our client’s care as well as with our clients, where possible with their consent. Finally, where context is concerned, we need to be open to adjusting our perspective on what might constitute “wellbeing” for this sector of our population and, rather than focusing on future-oriented goals that the uncertain amount of time left for living may place beyond reach, concentrate instead on what, for this person, in these circumstances, could improve their experience of the here-and-now. Part 2, “Intervention”, begins by addressing the task of assessment and provides useful guidance on managing what can seem like ‘a wheel in constant motion’ (p78) as one endeavours to discern the key issue, whose problem it is, and suitability for treatment. The formal, questionnaire-based approach now common for determining eligibility for receipt of virtually any type of service is not best-suited to those who are suspicious or wary of disclosing intimate personal details, cannot easily formulate concise answers, and may additionally have complicating factors such as hearing loss, a speech impediment or cognitive deterioration. A “middle way” approach… ‘[that] offers an engagement strategy that is person centred vs disease focused’ (p93) is recommended as not only more appropriate for seniors, but also less likely to enhance their distress and feelings of disempowerment in the face of yet another ‘expert’. Similarly, for clients who have little – if any – understanding of therapy, have likely not self-referred, and may not even know precisely where they are or why they are there, establishing connection, facilitating engagement and building trust requires particular sensitivity and often creativity. 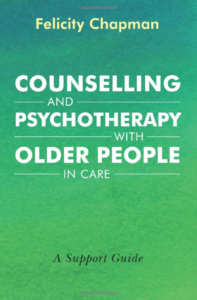 Multimodal interventions – with Acceptance and Commitment Therapy (ACT), Narrative Therapy, Reminiscence Therapy and mindfulness-based techniques being just some of the examples given – can be of considerable assistance as, as the author astutely points out, ‘for seniors, the saying “fit the therapy to the person not the person to the therapy” is never more relevant’ (p129). Consideration of ‘The Bigger Picture’, with which the third part of the book is concerned, puts a particular spin on otherwise familiar concepts. Take the need for therapist self-care in a context of wave upon wave of bereavement and loss of loved ones, and consistently having to talk and think about death and decline – our own as well as that of our clients – in a society that all too easily equates “old” with “obsolete” or “unproductive burden”. A society that can hold a somewhat narrow view of what constitutes a “positive outcome” and, perhaps unconsciously, wonders why we bother. Our need for peer recognition, emotional support and validation can be hard to come by. The implications of this for training therapists, care workers and others are beyond the scope of the book, but the four recommendations contained in the final chapter on “Building Senior-Friendly Care Systems” are worth noting: private rebates that appreciate complexity; models of training that are not dominated by clinical psychology; services free from requiring a mental health care plan, and active attempts to offset internalised ageism. The first of these is a call for recognition that interactions with care staff, whether facility or community-based, or with medical practitioners and relatives, may be necessary, but are supplementary to therapy sessions, which for a variety of legitimate reasons may run over time or be cancelled. Nevertheless, such conversations consume time and energy, thus financial recompense that is based purely on sessional attendance will not encourage more therapists to work in this field. This book is thoroughly researched as well as being an accessible and engaging read, enlivened by case studies and the author’s passionate and practical commitment to the wellbeing of older adults. I recommend it to all therapists, not least because whatever we are able to do now to improve prospects for the elderly is an investment in our own future; one day we too will all be seniors.